As we left Paphos, seven Black-crowned Night Heron flew over the road outside Gareth’s hotel. On arrival at Phassouri we stopped to find several European Serin singing in the eucalyptus plantation and then a Black Francolin at the start of the reed beds. Two Squacco Heron, several Little Egret and a Purple Heron were feeding on the edge of the reeds where we could hear Eurasian Reed and Sedge Warbler singing. A large snipe flew out of the reeds and into some low vegetation near to us and we were delighted to realise it was a Great Snipe. To aid our ID a Common Snipe also flew over and the differences were obvious. In among the many Common Swift flying over we picked out at least three Pallid Swift and several Red-rumped Swallow were also seen. A male Common Redstart was in the plantations. The pool near the deserted sheds was drying up and we found Little Stint, Little Ringed Plover, Wood Sandpiper, Ruff, Common Redshank and Dunlin feeding there. Two Woodchat Shrike were in the nearby tamarisks. On the Gravel Pits we found more than ten Whinchat and several Northern Wheatear as well as a singing Common Nightingale and a resting Common Buzzard. In the church gardens there were two Lesser Whitethroat, a Tree Pipit, an Ortolan Bunting, an Eastern Orphean Warbler, a couple of Willow Warbler and male and female Blackcap. We could only find about fifteen Greater Flamingo on the Salt Lake and in the waterlogged area along the south side of the lake we saw a Black-tailed Godwit and several Glossy Ibis. A couple of Eastern Olivaceous Warbler could be heard singing. On Lady’s Mile we quickly found several Slender-billed Gull which had been one of Gareth’s targets. In the end we counted around 40 of these birds and also two Common Black-headed Gull, a couple of second calendar year Armenian Gull, a scruffy second calendar year Caspian Gull and several Yellow-legged Gull. A Spotted Redshank attaining its black breeding plumage was the star of the waders there which included Common Sandpiper, Common Greenshank, Marsh Sandpiper, Ruff and Kentish Plover. We didn’t have to wait long in the Zakaki Marsh hide before we saw a male Little Crake and then a female also appeared to our right. Five Ferruginous Duck were on the water with two sleeping Northern Shoveler and a Green Sandpiper. Little Egret, Common Moorhen and Glossy Ibis were feeding on the mid between the reed stands where Sedge and Eurasian Reed Warbler were seen. Two Laughing Dove flew into the port area as we drove by but we couldn’t relocate them for better views. We decided to make a quick visit to Kensington Cliffs on our way back to Paphos and Anarita Park. It proved to be a good decision as we found six Eleonora’s Falcon, newly arrived and flying around the area. Both Cyprus Wheatear and Cyprus Warbler were singing on bushes below us as was a Sardinian Warbler. After some searching we finally located at least two Alpine Swift. As we drove past Pissouri a Great Spotted Cuckoo flew across the motorway in front of us. We found another one on a rock at Anarita Park – our last location of the day. 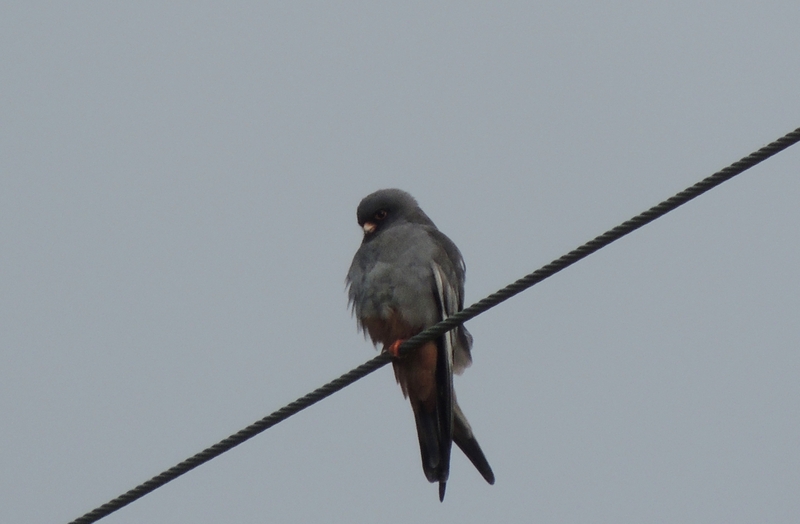 Here we found around ten Lesser Kestrel and a lone male Red-footed Falcon as well as three European Roller, a Common Whitethroat and two Tawny Pipit. Unfortunately only I managed to see a male Pallid Harrier flying low and then out of sight being followed by a couple of Hooded Crows. A good location at which to finish a great day’s birding. Categories: Cyprus Birding Tours Trip Reports | Tags: Akrotiri birds, Anarita Park, Armenian Gull, Black-winged Stilt, Cyprus Birding, Cyprus birds, Cyprus birdwatching, cyprus trip reports, Cyprus Warbler, Cyprus Wheatear, Eleonora's Falcon, European Roller, Ferruginous Duck, Great Snipe, Great Spotted Cuckoo, Lesser Kestrel, Little Crake, Pallid Harrier, Pallid Swift, Purple Heron, Red-footed Falcon, Slender-billed Gull, Spotted Redshank | Permalink.